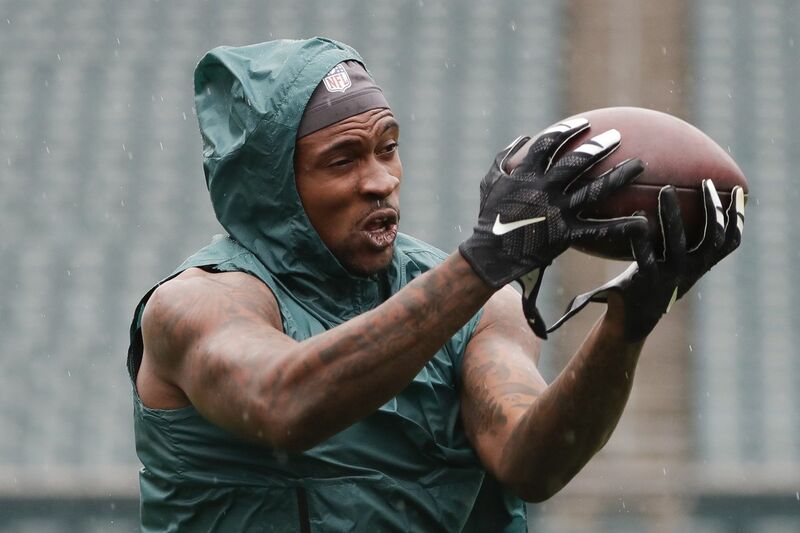 Eagles wide receiver Alshon Jeffery catches the football during pregame warm-ups before the Eagles played the Colts. Alshon Jeffery is close to returning to games, but he has not yet been cleared for contact. However, running backs Jay Ajayi and Darren Sproles appear on the verge of rejoining the lineup. Jeffery, the wide receiver who has missed the first three games while recovering from offseason rotator-cuff surgery, will continue to increase his workload this week. He could receive clearance as Sunday's game against the Tennessee Titans approaches, but there's still no word on when that will come. "He's getting close," Pederson said. "We'll get him in the mix a little bit more this week and see where he's at health-wise." The good news for the Eagles is that running backs Ajayi and Sproles could be returning to the field. Pederson said they're "both day to day" and will be evaluated Tuesday. "I would expect, barring any setbacks, that they'll both be available," Pederson said. Pederson clarified that he meant available for practice. Neither player practiced last week. Their game availability will be determined later in the week. Ajayi was absent against the Colts with a back injury. Sproles has missed two games with a hamstring injury. Safety Rodney McLeod is still being evaluated for a knee injury and Pederson said he'll have an update Wednesday. McLeod said he felt "good" after Sunday's game.